The new Alphacool AGB comes in three different models. You can either connect a Laing DDC, the Alphacool DC-LT or the Laing D5/Alphacool VPP655 at the backplate depending on the model which you use. The brushed plate provides an optical finishing touch which is underlined by the high quality processing. The front consists of a scretch-secure soft-touch surface painted in black-matt. The Eisfach is mounted in two of the front 5,25" bays which provides a good overview of the container and the fill level is easily being checked through the lighted window at the back. 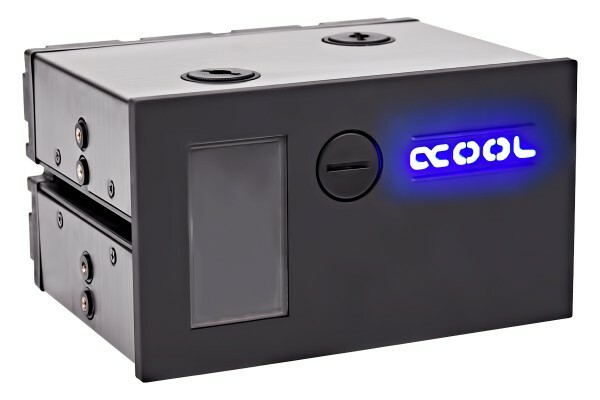 Additionally, the Alphacool logo in the front can be lighted by connecting the 3-pin connector with a power source. A lot of details complement the first impression! Two 1/4" holes at the top side are available for the first filling. To refill you can simply remove and extract the fillport in the front and two 1/4" holes at the bottom side facilitate the draining of the liquid. There are two lighting modules at the right hand side at the back of the container behind the window for 5mm LEDs. This provides a unique opportunity for personalised lighting and optic. Further two holes at the left hand side provide additional opportunities to fill or drain the liquid. The last two 1/4" threads are used to fill or drain the container. A Bubble Down module has been placed behind the inlet to prevent turbulences that could lead air into the watercircle. Alphacool's new power pump series, exceptional performance at an unbeatable price. The 12V pumps can simply be connected directly to the system PSU and the pump will start with your PC for maximum convenience and safety. This pump is ideal for PC and other electronics water cooling. The DC pump is equipped with an electronically commutated spherical motor. In a pump with a spherical motor the only moving part is a spherically shaped rotor which in this pump is held in place by a bearing ball made of ultra-hard and wear-resistant ceramic. The spherical bearing of the rotor offers many advantages: For example an increase of bearing play is impossible due to the design, allowing the pump to run quietly and smoothly over its whole lifespan. A separate magnetic shielding of the pump is not needed. The ball motor design allows efficient operation of the pump in combination with excellent performance. The pump can simply be connected to a 12V Molex connector of the system PSU. The special feature of this model is the fact that only the pump core itself is shipped. Why pay more for all the things you won't need when using this pump with a third-party pump top? Another feature is the ability to be adjusted in five speed settings. Not intended for continuous operation with fluids containing titanium dioxide or glycerin. Many pastel colours typically use these additives. Is deze pomp-reservoir combo goed genoeg voor een gtx1080 m03 koelblok (jetstream max oc), 2011-3 koelblok (6850k max oc), 30-60mm x-flow 120mm radiator, 30-60mm x-flow 240mm radiator, 280mm monsta radiator en 2 x2 d-ram koelblokken? Yes this is a good product for your system. Led belauchtung ist inkusive, oder muss man die zwei LED als extra kaufen? Die ist inklusive, es sind aber keine LEDs sondern die Technik kommt aus dem Monitorbereich für die Hintergrundbeleuchtung.